And at night, please, stay in your house, keep the doors closed and the windows closed until we sort this out. It looks as if there’s a revival of the werewolf genre. Granted, it’s nothing special what’s being produced in this area. “Night Wolf” was abominably bad. “Wolves” was a failed attempt to launch a commercial teen product. And “Wer” was an original attempt to revitalize the genre. The first two monstrosities excelled in terrible renditions, ridiculous grime and unabashedly exploiting this sub-genre with the ultimate goal to initiate a commercial and profitable franchise. “Wer” was an original concept in which the werewolf type didn’t answer to the clichéd representations as in older movies. “Late Phases” is situated somewhere in between. On the one hand it’s successful when it comes to the acting and the approach. But on the other hand it’s a complete failure when it’s about the appearance of a werewolf and also the total lack of tension. And that’s exactly what I’m always looking forward to, when watching a werewolf movie. Lets start with the positive part of this would-be horror: the acting performance. Indeed singular because the whole film is dominated by Nick Damici as Ambrose McKinley, a blind Vietnam vet full of resentment and hatred against society. It’s not explicitly said like that in this film, but the way he deals with people and hearing his biting, sarcastic tone says a lot. He has nothing good to say about his own son either. The only living beings he can deal with very well is his guide dog Shadow and a female neighbor whom he met when he moved into his little house at Crescent Bay, the last stop for the elderly. Now believe it or not, exactly these two fortunate are torn to pieces the first night that he’s there. According to the local police they get such reports from Crescent Bay on a regular base (and what’s even more weird it’s once a month) and they assume these are wild dogs or something in that nature that attack the defenseless elderly. So, close doors and windows, stay inside and you definitely shouldn’t go wandering in the dark. That’s their advice. Our war veteran, who’s obviously clever enough, immediately draws the correct conclusion and knows that it’s obviously something else than some petty predators. Nick Damici is amazing in his role as the gruff and grumpy blind antisocial veteran. And that’s where the praising of this movie stops. The rest of the cast fails in every area. Most of them are just fake, one-dimensional characters. From the dressed up tea-party ladies who need to poke their noses into everything all the time to the son Will (Ethan Embry) and his wife who exhibit utter outrage about the rhetorical gift of Ambrose. Even the arrogant guard and tactless police officer aren’t missing. The only one who gave some splendid counteraction towards Ambrose was the officiating Father Roger (Tom Noonan) who always listens to the tirades of Ambrose with an amused smile. 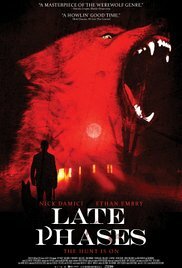 The fact that the main topic of the story (a werewolf) is revealed in a very early stage in the film, doesn’t contribute to the building up of a certain tension. From there on it’s just a guessing game of who’s the person in the community who suffers from terrible hair growth when there’s a full moon. And that leads us to the phenomenon of the werewolf. What a carnival show this was. A Halloween costume party is nothing compared to it. I liked the costumes from the Muppet Show a lot better. Especially when I saw these striking tufts on the ears, I totally got the giggles. And then a golden tip for future directors who try to produce a werewolf movie. If you can’t even succeed in creating a transformation scene as terrific as in “An American Werewolf in London” (for me THE example of an excellent werewolf film), please let go of the idea and don’t consider even on starting with it. Because that scene in “Late Phases” was terribly amateurish. Even the camera angle from above was recycled. Only there was nothing more to see than a bunch of hairs. Even the original scene with the steel lung couldn’t make up for it. Ultimately, it was (thanks to Damici’s masterful performance) still an enjoyable movie (even though I found the discovery he made at the beginning a bit exaggerated and I had to chuckle a moment about the fact that despite his blindness, he still could aim miraculously well). There were also too many irritating ridiculous glitches (Here’s another one. His son is worried about the amount of money his father is carrying around, but that one’s intestines are scattered around a whole house and dear father has an arsenal of heavy guns in his house, turns out to be quite normal). Even the symbolic meaning of Will’s action in the end, remains a mystery to me. I hope to see a more convincing werewolf next time, with such an appearance that I don’t have the feeling that I’m observing a masked ball. I haven't seen a werewolf movie in years! Maybe because I haven't seen one with an excellent transformation scene… Really, it's not that hard to get it right especially with today's technology… This one won't definitely be on my list, perfect performance or not by the lead actor. Is the genre dead? Who do you think would absolutely get it right from beginning to end?